She was born and resides in Carlos Casares, Province of Buenos Aires -Argentina. Poet and Writer, Cultural Manager, Secretary Zonal -Pcia. of Bs As and Zonal Director for Children and Youth in Carlos Casares of SIPEA Argentina (International Society of Poets, Writers and Artists), highlighted in 2015 in Art, for her work and career in Literature, and in the year 2016 Gladiator of life "by the Honorable Deliberative Council of Carlos Casares (Bs. As. ), in 2017 and 2018 distinguished with the Arc of Córdoba, for her work and trajectory in favor of the "National and International Culture", distinguished in 2018 with the "Star of the South Award" from Uruguay to the world. Member of the North American Academy of Modern International Literature, she has been a Jury of National and Border Countries Contests. 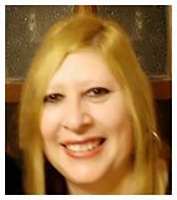 Organizer of National and International Literary Contests and Meetings at Carlos Casares (Buenos Aires), she has participated in Encounters, Congresses, Book Fairs, in numerous Anthologies, integrates the "One Hundred Poets for Peace" Anthology and "A History for a smile" of the Diamond Program. She has also participated in National and International Literary Contests, where she obtained numerous important prizes. Author of the book " Ink Soul", in which her lyrics highlight a deep feeling of love, social justice, equality, peace and above all the utopia of a better and more just world.